Warp Bros. is a premier U.S. manufacturer of Genuine, Top Quality extruded polyethylene plastic sheeting, acrylic safety glazing, storm window materials, drop cloths, lawn & garden plastic products, trash can liners, over sized storage bags, ribbed floor runner and ribbed shelf liner for the home and industry. A safe natural and fun treat to satisfy the natural craving for salt and supply essential minerals. Fits treat-k-bob or us as a refill to #089165 and #089166 carrot and apple licks. . . .
6 mil thick used for a wide variety of applications from covering items to vapor barrier to lining under items. Fully waterproof. Made in the usa. 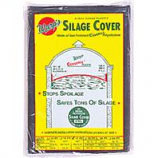 . .
4 mil round silo cover enhances fermentation and prevents spoilage of silage in round upright silos. Made of black polyethylene. Made in the usa. . .